The Irish Red and White Setter is considered a healthy breed but is prone to some conditions such as Canine Leucocyte Adhesion Deficiency, Posterior Polar Cataract, and Von Willebrand’s Disease. It is important that you work with a reputable breeder to avoid these inherited and genetic conditions. 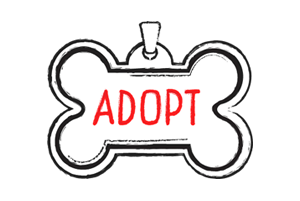 It is recommended that you inspect the puppy and make more than one visit to see your desired puppy before you purchase him or her. Canine Leucocyte Adhesion Deficiency is a disease that affects the immune system in Irish Red and White Setters. This is a genetic condition that is passed down from the parents, and DNA testing can reveal whether or not a puppy or the parents have the trait. 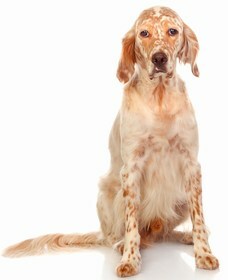 Posterior Polar Cataract is a condition that may be inherited by your Irish Red and White Setter. 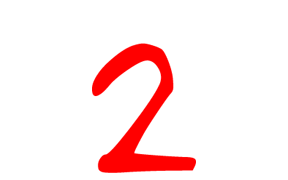 This condition causes a mass to form on the lens of the eye. Cataracts may be present in one eye or both, and if they continue to progress, they can leave your dog blind. Sometimes surgery is an option for the cataracts, but your veteranarian would make this decision. The last disease that you need to watch out for is Von Willebrand’s Disease. This disease is characterized by a protein deficiency that results in your dog’s blood platelets not being able to clot or seal together. The Irish Red and White Setter has a life expectancy of 11 to 15 years. The Irish Red and White Setter was on the fast track to extinction at one point and thanks to some sportsmen; they made a quick comeback. While the breed is still a bit rare, you will find that these dogs are fun-loving, energetic, and sporty. When you think of an Irish Red and White Setter, the word intelligent will likely come to mind, and this term fits well. This breed knows what they want and they know how to please their owners too. This breed does need a lot of stimulation in both the mental and physical sense, so it’s a kind that is recommended for families who love adventure and the outdoors. Your Irish Red and White Setter will set out to follow you up a mountain, sit in a canoe, and even hike wherever you want to go. This is the perfect family dog and your new puppy will get along well with children. 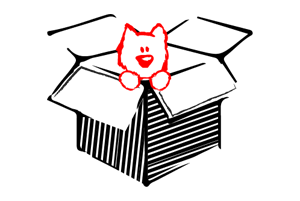 In fact, your puppy will probably wear out your children from with all the energy it has and vice versa. This breed is not aggressive with other animals and will get along with even the smallest pet in the house. You should avoid leaving your Irish Red and White Setter alone at home for any length of time as he or she is known to be destructive. You should avoid placing your Irish Red and White Setter in a crate, as this may frustrate them or cause more anxiety when you leave the home. When it comes to training, the Irish Red and White Setter is easily trained, but only with the right trainer. You need to be firm, committed, and affectionate as you lead the breed to greatness. This dog will not respond well if you yell, do not follow through, or are too firm with them. Positive reinforcement will go a long way. 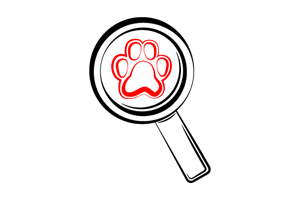 If done right, your trained Irish Red and White Setter will follow all of your commands and will be easy to handle. The Irish Red and White Setter does have a moderate grooming schedule that you need to stick to; otherwise, he or she may lose the silkiness in his or her coat. When it comes to brushing their coat, you should brush it once per day to keep any tangles out. 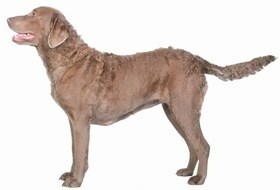 This breed will shed a lot throughout the shedding season, so be prepared to find piles of hair everywhere. You’ll need to pay particular attention to his or her coat during this time and continue to brush it well. 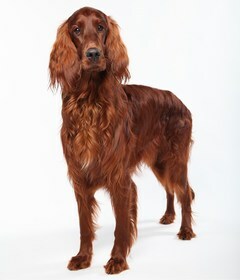 You also need to make sure that you trim your Irish Red and White Setter’s nails, so that they do not become too long. 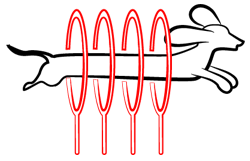 Once a month is typically good, but you may need to do it more often depending on how fast the nails are growing. Bathing your Irish Red and White Setter is not as important, and you should only do it on occasion when he or she is dirty or smells bad. Make sure that you check your dog’s ears and clean them weekly to remove any buildup of dirt and wax. 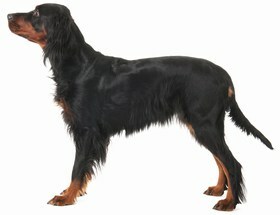 Your Irish Red and White Setter needs to eat roughly two and a half to three cups of dry food per day. You should split this amount up into two meals and feed your puppy once in the morning and once at night. When choosing a dry dog food for your Irish Red and White Setter, make sure that you choose one that’s made for an active puppy and then progress to the next stage as your puppy grows. You want to choose food that has a high nutrient value and avoid wet foods that provide no nutrients to your puppy. Looking for an Irish Red and White Setter? The cost of an Irish Red and White Setter puppy will vary, but you can expect to pay anywhere between $600 and $1,000. You will also need to factor in other costs such as food supplies, vaccines, checkups, pet supplies, and similar. You should estimate anywhere between $600 and $1,500 per year for the extra expenses. Ranking takes into account a few basic factors including cost, skill level needed, high vs low maintenance and how critical regular training is to success. 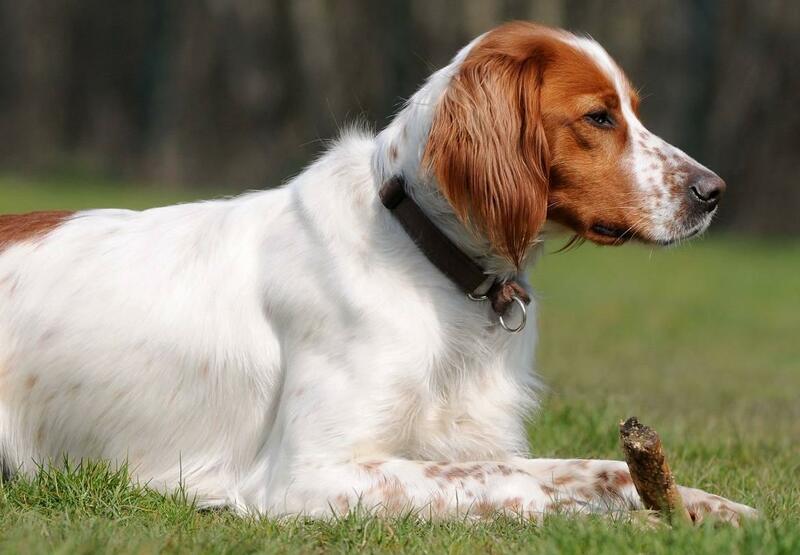 The Irish Red and White Setter is a great dog to own and can be trained easily if you are willing to commit the time and energy needed to do so. You will find that this breed is eager to please and loves a family outing just as much as you and the rest of your family does. This breed ranks a 2.